History, hilarity and some horrible goings on. Howard of Warwick, the No 1 Best Selling author who brought you The Bayeux Embroidery, has fabricated yet another outing for the world’s most medieval detective. 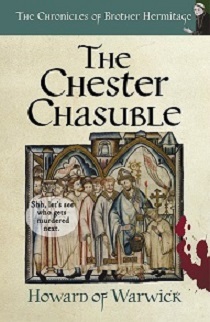 At the request of some rather peculiar monks, Brother Hermitage and his companions, Wat and Cwen the weavers, travel to Chester to try and work out who has suffocated a priest with his own chasuble. They’ve even been recommended for this job by some very important people, but of course it starts to go wrong even before they arrive. Chester appears to be full of some very strange people and some even stranger religious institutions, all of whom detest one another with fervour. There are Saxon Nobles who have run away from the Normans and townsfolk for whom corruption is what they do best. 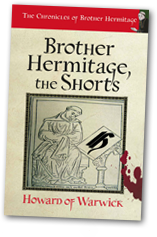 Brother Hermitage must find out if the man who got killed is all he seems to be. Then there’s a number of reasons why he could have been killed. And the list of who could have done it is a bit too long, even for Hermitage, who likes a list. Why does Brother Merle seem so keen on dead people? Who is the mysterious monk in the tower? How many Saxons does it take to change a kingdom? 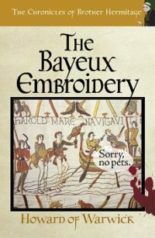 The Bayeux Tapestry is no laughing matter. Well, apart from the rude bits, obviously. Who would commit such a heinous crime? Odo himself? Another nun, perhaps? Some Saxons? The Archbishop of Canterbury? The people of the marshes? Well, it could be anyone really, and that’s generally a problem for Brother Hermitage. With Wat and Cwen, erstwhile weavers of “adult” tapestry themselves, he must solve the crime or face the consequences; as usual. The best plan is probably to wander around Kent rather hopelessly, and trust that something occurs to him right at the end; also as usual. How did it come to be? Who made it? And who thinks that they should have been given the job instead? The man who barely survives his own investigations. The sleuth who seldom asks anyone the right questions. 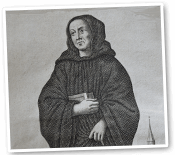 The monk who is firmly medieval and slightly detective. 13 books and 80,000 sales; some people never learn. It’s more medieval mystery for people who laugh. Norman England is still full of real people; the incompetent, the hopeless and the just plain useless. But what’s this? 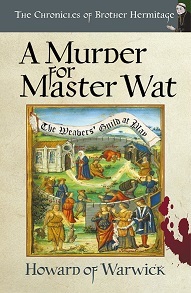 At the monastery of his friend Abbot Abbo, a young, naive and bookish monk is killed in chapter 1? Surely not? It can’t be. The death of this particular monk sets off a chain of events that’s tangled to say the least. The news must be taken to Derby, home of Wat, erstwhile weaver of pornographic tapestry and Cwen, fierce and independent weaver in her own right. Then the death must be investigated, of course it must, and the guilty held to account. But the guilty seem to be queuing up in this case, and show not the least sign of shame, let alone guilt. In fact, they’re quite proud of what they’ve done. Brother Hermitage, the King’s Investigator, made a lot of enemies over the last 11 books. It was bound to go horribly wrong sooner or later. “Horrible” and “wrong” crop up quite often where Brother Hermitage is concerned. But, you need to read the book if you want to make any sense of all this; even then, there are no guarantees. Some people have said “hilarious”, some have said “very, very funny,” others have said “stupid” (the good and bad kind). Nearly 100,000 people have now succumbed to the nonsense that is Howard of Warwick. 1,000 reviews, Amazon number 1s, 5* littering the floor of the scriptorium? There must be something in it. On the coat tails of the best-selling Domesday Book (No, Not That One), someone has let out volume II of William’s Adventures in England. It’s history, but not as we know it. England, 1067-ish and the King’s grip is tight. His Earls of Northumbria will keep dying though. Every time he appoints one, someone sticks something in them, or sets light to them. Something is going on and he has a strong suspicion who’s behind it. If he’s right, it could mean real trouble. In Viking Vinland, the man who would be king awaits rescue – and waits. If no one else is going to do it, he will just have to rescue himself. There’s only a bit of sea to cross, he will sail home and take his throne by force. Although he might need a bit of help. And then there are the Danes and the Scots who have their own ideas. If Volume I is anything to go by, this situation is a recipe for disaster. And if you’ve got the recipe, you might as well make a disaster. The text books would have you believe that everything in the past was carefully planned and organised. That the leaders of the time were clear in their aims and decisive in their actions. That the people knew what great events they were living through. No one made mistakes, no one incompetent ever got to be in charge and above all, no one ever had a laugh. The 16th book to do things to history that it never asked for, returns to the aftermath of the most famous date ever. 1066. Well, the year after actually, no one ever talks about that – and with good reason, it was chaos. ‘Had me chuckling the whole way through,’ Discovering Diamonds. When weavers in the 11th century went out to play there was usually trouble. In this case it’s death, which Brother Hermitage, the King’s Investigator, always finds very troublesome indeed. Wat the Weaver doesn’t want to go to the weavers’ Grand Moot in the first place and no one can make him. Except Mistress Cwen, of course. When they get there it all starts so well, but it only takes the blink of a bat’s ear for murder to rear its ugly head and stare straight at Hermitage. He’s starting to think that being King’s Investigator is actually a cause of death in its own right. But this time, the perpetrators seem quite proud of their actions and have a lot more planned. Is this a race to stop a murder, rather than deal with all the mess afterwards? Hermitage certainly hopes so, although, as usual, he’d rather the whole thing just went away. A Grand Moot of weavers should be a time of joy, celebration and cameraderie, not greed, violence and a generous serving of just plain stupidity. In a modest little tale for the season, Brother Hermitage heads for London. 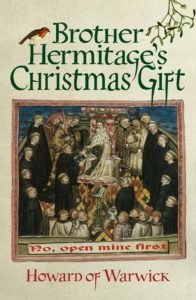 William Duke of Normandy is to be crowned King of England on Christmas day 1066; and he expects presents. For reasons beyond reason the monastery of De’Ath’s Dingle is invited to the ceremony and the only ones who can be let out on their own are Brother Hermitage and Wat the Weaver. But it will be a rush to get there. With only 7 days to travel over 100 miles, the pair must cross a frozen and largely lawless country if they are to make it to Westminster alive. And then there’s the problem of Wat’s attitude towards gifts in principle. He doesn’t mind a reasonable exchange but simply giving sounds like a very poor deal. Perhaps the days of the journey will give Brother Hermitage the opportunity to breath the spirit of the season into his weaving friend. 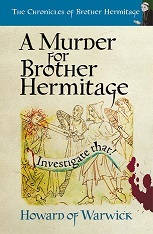 For a medieval monk who hates investigating anything, Brother Hermitage seems to do it quite a lot. As he stumbles into his 10th full length tale, signs of improvement remain stubbornly invisible. When Stigand of Arundel arrives in Derby with a commission from King William to buy some very expensive hawks, Wat, Weaver of adult tapestry sees an opportunity for profit. Brother Hermitage sees only trouble. We then discover that Cwen, fine young tapestrier with a good eye for colour, nimble fingers and a frightening temper, also has some very peculiar relatives. So peculiar that they warrant investigation in their own right. Once more there is murder and of course there are Normans and Vikings and Saxons. If any of them actually has a clue what’s going on they’re not saying anything. In his previous debacles Brother Hermitage relied on Wat and Cwen for guidance, support and frequent reminders to use some common sense. This time they’re all up to their eyes in it but surely things can’t go any worse? Once more Brother Hermitage toils to avoid his duties as King’s Investigator, and fails miserably. But this time it’s personal. There are Normans involved of course, so far so normal. Add a monastery that no monk of sense would go anywhere near and a village of pagans whose answer to every problem is to set light to it and Brother Hermitage is out of his depth almost immediately. Wat and Cwen the weavers bring some common sense to the situation, but there isn’t much of that to begin with. 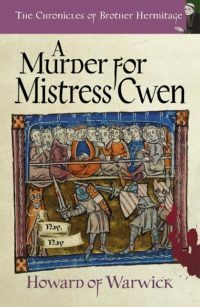 It’s medieval crime with all of the normal human failings – and a few new ones as well. People laugh out loud at Howard of Warwick. More medieval crime comedy; the genre that hides in the bushes and makes strange noises. Clearly this a Very Important Victim. Suspicions are raised by a host of fascinating characters, including Hereward the Wake, all of whom claim to have loved the victim dearly, but who all benefit from the death in one way or another. It’s also a bit odd that King William insists that he is not to blame, despite boasting about being the killer of an awful lot of other people. On top of all that there is even a rival for the role of Investigator. As Hermitage doesn’t want to be an investigator that’s good, isn’t it? Ploughing in with Wat and Cwen at his back, side and sometimes in front, Brother Hermitage relies on his well established methodology (hoping something occurs to him at the last minute). But that might not be enough this time. The mysteries of Brother Hermitage have been variously described as “hilarious”, “laugh out loud funny”, “side-splitting”, and “stupid” – which is a bit of mystery in its own right. Go on, give it a try…. It’s new. It’s medieval. It’s very silly. 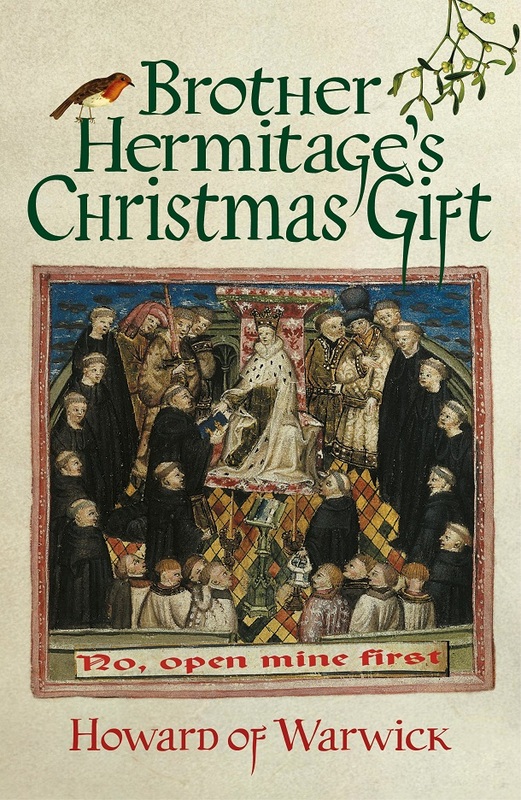 Except the expert is Brother Hermitage, so I wouldn’t get your hopes up. Called once more by King William – who doesn’t even know what he’s calling for – Hermitage, Cwen and Wat the weaver set off to deal with the greatest mystery of all. A mystery that has been protected and guarded for years by a secret brotherhood sworn by awful oaths. A mystery only known to a priest who now happens to be dead. A mystery hidden in a monastery that isn’t even supposed to exist. A mystery of such value that the unscrupulous and greedy are also after it, and these particular unscrupulous and greedy know Brother Hermitage very well indeed. Will all be revealed in a satisfactory manner? Will the convoluted trail lead to a revelation of staggering significance? Hardly. This is a Chronicle of Brother Hermitage, after all…. From the world’s best-selling author of comedy historical mysteries comes another largely pointless excursion. Medieval Shrewsbury is surely no place for murder. Not in this charming town would investigative monks wander around bothering people over every little incident. His companions, Cwen and Wat, weaver of pornographic tapestry think this is a very bad idea. So does the whole town Moot. And the sheriff and the rest of the population. And then there are the nuns. Hermitage has never been strong in the face of adversity and an adverse nun is more than he can cope with. A whole order of them is something to be strenuously avoided. But there is always his duty. It’s got him into trouble so many times; why should Shrewsbury be any different? 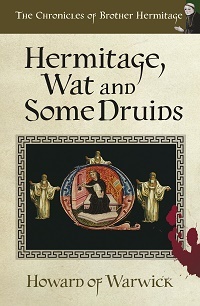 Brother Hermitage keeps going – this time with druids. Is it a murder mystery? Is it a thriller? Is it just something gone horribly wrong? Brother Hermitage, Wat, weaver of pornographic tapestry and Cwen, weaver in her own right and the fiercest of the lot, are commanded to find one dead Norman in the whole of Wales – as usual under pain of death. It’s all complicated enough, but when what seems like the whole of the country wants to join in, things get very messy. And then there are the druids, and stone circles, and sacrifices…. “he who has laughter on his side has no need of proof” Theodore Adorno. As if one trilogy wasn’t enough…. 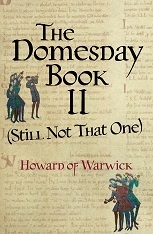 Humour ahead: The works of Howard of Warwick are hilarious and very silly. If you value your historical proprieties look away now. After 1066 not all the Normans were in England. Those left in Normandy were up to no good and the ghastly Le Pedvin, wants one of them dealt with. 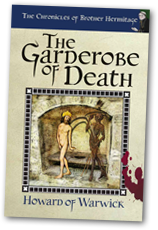 Brother Hermitage, the most medieval of detectives, and his companion Wat, weaver of tapestry you wouldn’t want your children to see, are dispatched to the Norman home-land to bring a killer to justice. How they do it is up to them and why they’re doing it is none of their business; they have their orders and the consequences of disobedience will be death – as usual. Yet more from Brother Hermitage. When events take a turn for the truly bizarre, Hermitage and Wat find themselves up to their Saxon socks in people who want them dead, people who want one another dead and people who seem to want everyone dead. They must find a missing maiden, placate a giant killer and reveal the awful secret of the Tapestry of Death before matters are resolved. Resolved largely unsatisfactorily, but then that’s life. 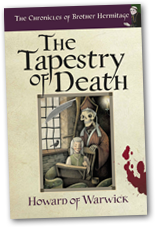 With a monk, tradesmen, priests, Normans and Saxons, The Tapestry of Death should be a solid, traditional medieval who-done-it, but it isn’t. Really, it isn’t. Authentic and accurate representation of the time? Barely. Hilarious and very silly? Now you’re getting warm. Brother Hermitage is at again…. England 1067: Henri de Turold, King William’s favourite hunting companion has been murdered. How anyone actually did it, given the remarkably personal nature of the fatal wound, is a bit of a mystery. Lord Robert Grosmal, of disordered mind, disordered castle and Henri’s host at the time, knows that King William gets very tetchy when his friends are murdered. He sends to the nearby monastery of De’Ath’s Dingle for a monk to investigate. Medieval monks are usually good at this sort of thing. 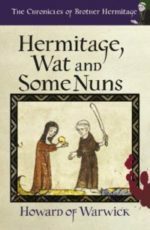 Brother Hermitage is a medieval monk but he’s not very good at this sort of thing. Motivated by the point of a sword he and his companion Wat the weaver set off to solve the crime. Oh, by the way King William is arriving that night so they better get a move on. Brother Hermitage’s second criminal investigation reveals many things. Improvement is not among them. If you are looking for a poignant evocation of the medieval world, an insightful exploration of the characters of the time, buy a different book. Ellis Peters is quite good. Where it all begins – The Chronicles of Brother Hermitage, Book 1. 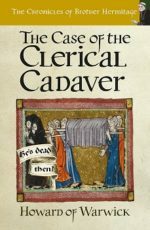 England 1066: At the monastery of De’Ath’s Dingle, during a completely pointless theological debate, there is a mysterious death. 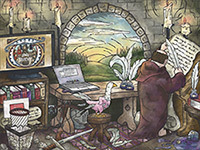 Routine business for the average investigative medieval monk. Unfortunately this isn’t a tale of average monks. When Brother Hermitage, innocent in every way, including bystanding, is lined up for execution, he begins to wonder if something might be going on. Perhaps his new companion Wat, weaver of pornographic tapestry, can figure out what it is. Before it’s too late. 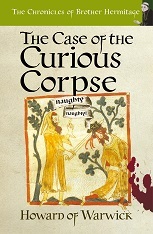 These tales cast a new light on medieval investigation, but it’s not a very bright light. 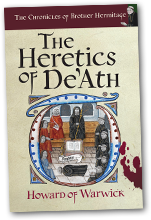 They follow the comings and goings of Brother Hermitage, the monk who somehow resolved the mystery of The Heretics of De’Ath.The monk who stumbled though the murder of The Garderobe Of Death. The monk who wandered through The Tapestry of Death. And the monk who came out alive from Hermitage, Wat and Some Murder or Other. 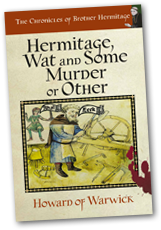 Doing what no other storyteller of medieval murder would dare do, probably quite wisely, Howard of Warwick, takes us into the mind of Brother Hermitage. Here we find there is quite a lot of room, but most of it is full of books. Read if your dare. Read if you must. Just don’t take anything too seriously. Special tie-in edition…now available in paper with words and everything. The time in Hastings, England is 1066 precisely. Duke William of Normandy may have just won the most recent battle in the area but he has mislaid something precious; something so precious no one must even know it is missing. He carefully assembles a team for a secret mission of recovery, (the assembly is careful, not the team), and he sends them forth to the north. But his secret is already out and another band has the treasure in their sights. In a race across a savage land, against the clock and against one another, two forces hurtle towards a finale of cataclysmic proportions; all in 29 concise and entertaining chapters. Find out what the treasure is. Find out who gets it first. Find out what happens to everyone afterwards. Find out some other stuff. Containing several facts and a brief appearance by a monk; it could have happened, it might have happened… but probably didn’t. Out of the Scriptorium comes an extraordinary history. A book so epic it has a map. 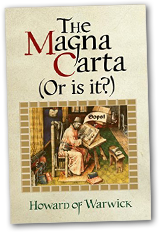 Read the full text of Magna Carta in Latin and English here! But don’t take the tale of its production too seriously – or seriously at all. 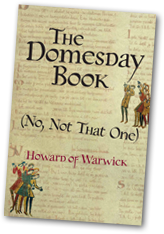 From the quill of Howard of Warwick, the world’s best selling author of historical humour, comes yet more History as it might have happened, but probably didn’t. To mark the 800th anniversary, Howard has forced his attentions on the most famous charter in history. Here is a Runnymede full of real people; confused, squabbling, ill-informed and largely incompetent. Never mind 800 years, it’s a miracle the charter survived to the end of its first week…. if it did! In The Magna Carta (Or Is It?) we discover that King John entrusted the copying of the original charter to one Aelward Dunktish, a man not normally reliable enough to pour water. The King must be up to something. And so must the nobles who want Dunktish for their own purposes. And then there are the King’s notorious mercenaries, the men of Touraine, who have ideas of their own, all of them involving death and horses. They’re all up to no good, and Dunktish IS no good. It’s the sort of tale that will end in disaster – except in the hands of Aelward Dunktish, it all starts with one.